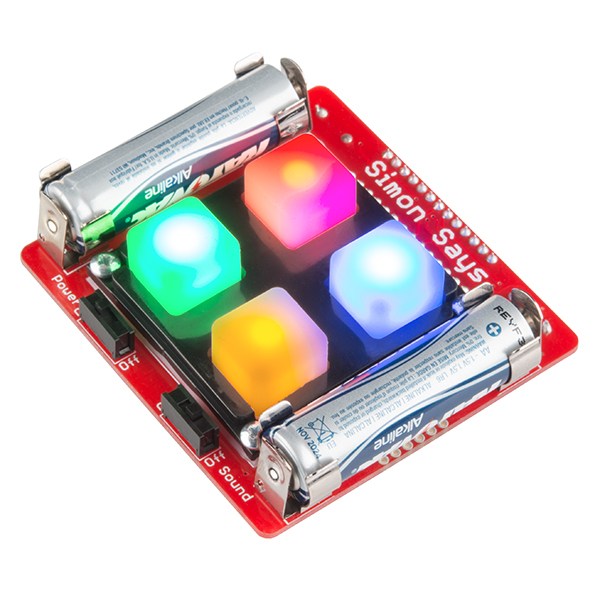 Our through-hole Simon Says Kit is a great beginner's kit and also a pretty fun toy. All components are through-hole, making this kit a great place to start when you're learning to solder. 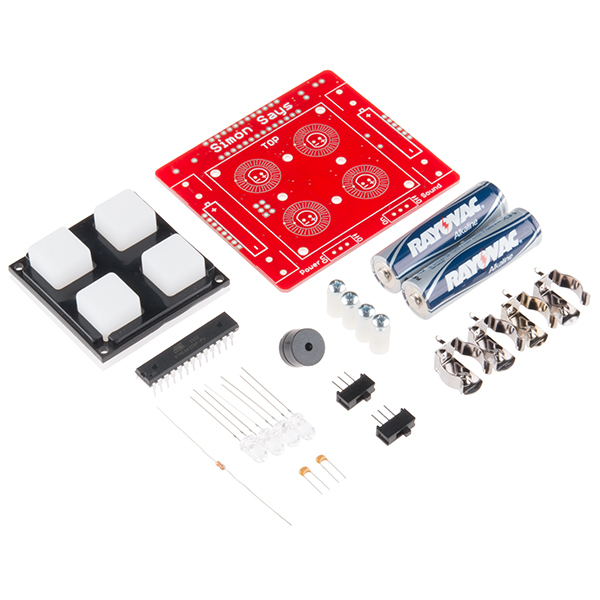 When building this kit, you'll have a chance to solder a 28-pin microprocessor, LEDs, battery clips and more. After you have successfully assembled the kit, you will have a greater knowledge of through-hole soldering and the tools, techniques, and terminology required to populate your own PCB prototype. You will have a development platform with 5 outputs (LEDs and buzzer), 5 inputs (buttons), and serial for debugging. And, of course, you'll have your very own Simon game! 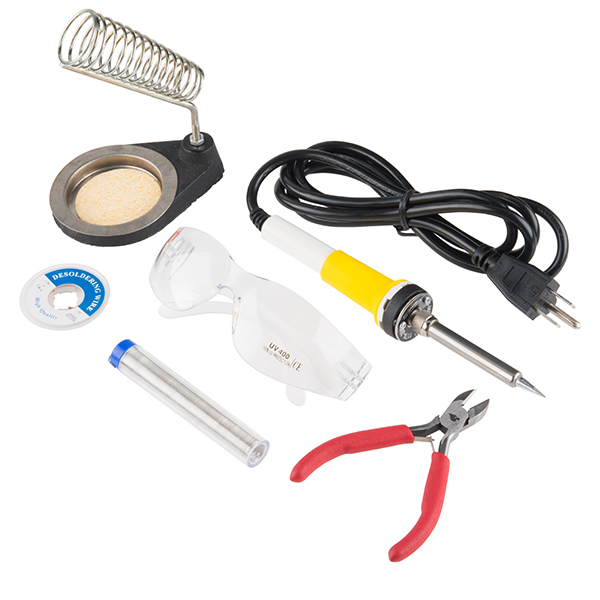 Assembly time varies, but for a true beginner with no soldering experience, the kit can take 20-40 minutes to assemble. I noticed that two of the annular rings are actually squares. Why is this? I thought at first maybe it's to mark which ones are ground, but only one of them is a ground. So why are two of them square? And what do you call them? Annular squares? Rectangular rings? I see them in pictures on other boards, too. This was the first thing that I've ever soldered, and I think that it did it's job. I am currently reprogramming it to play a different game with my 4-year-old. My only complaint is that the schematic and source code for the version that comes installed is difficult to find. There are several versions of each on the site, and to took some digging to figure out which was the correct one. Before putting this kit together, I hadn't soldered since I took an electronics class in high school. This kit includes most of the soldering tools I needed, and it gave me something I could use to brush up on soldering before moving on to other projects. Most of the included tools are quite nice and do their function well. The soldering iron is cheap and a bit clumsy, but it melts the solder just fine. I wound up scorching the PCB on the Simon Says kit a little, but it works fine nonetheless. You'll also need to be careful that the soldering iron stand is aligned and tightened properly. It won't be stable with the iron in it if you screw in the holder part at the wrong angle, and that would be incredibly dangerous. I didn't end up needing the solder wick, so I can't speak to its quality. Now, I ended up getting a few other items because I expected to need them, and I don't regret that decision. First, the included lead-free solder is harder to work with than lead-based solder. While I can understand that choice--lead is toxic and bad for the environment--I got a tube of lead-based solder as well. You may want to do the same if you think the pros outweigh the cons. More importantly, I also ordered a third hand. I am very glad I did that. The third hand kept the circuit board off the desk, preventing slips and wobbles and keeping it level throughout assembly. You should get a third hand. I cannot stress this enough. Third, I already had a multimeter, and I found it fairly reassuring while building. The continuity test helped me know that I had avoided solder bridges, and the diode test let me identify which color the LEDs were. It doesn't really matter where the LEDs go, but I wanted to match the photo on the front of the manual (which, if you look carefully, doesn't match the photo on the product page.) It's not essential by any means, but it'll give you a little extra peace of mind. This was how I was learning to solder. The instruction manual was great, the part on soldering was more informative than some tutorials I had watched. One nice feature about this project was the fact that the controller had a lot of pins that needed to be soldered. Doing ~20 solders in a row put me in a bit of a rhythm that was a nice feeling that probably would not have happened if I did only ~10 solders 2 at a time. I was more than confident enough for my next project, which was two breakout boards for a project that was going to be put in operation. For Simon Says, my 5yr old plays it. One issue has been mentioned by others, you need to squeeze the battery holder so that it has a good connection when the batteries are put in. Awesome learning set. Tremendous value for a beginner or someone that loves the game Simon. Great set. All the parts you need to learn. Super value. Sparkfun is awesome and this set is a great example why.